Gareth Southgate and England have a UEFA Nations League semi final against the Netherlands to look forward to in June, but before that they kick off their Euro 2020 qualification campaign with a double-header against the Czech Republic and Montenegro. Two victories will be expected from Southgate’s young but improving squad, but what else should we be looking for from these next two fixtures? Our experts have picked out five points of interest. England will be expected to dominate possession in both of their opening Group A fixtures, so we shouldn’t be surprised to see both the Czechs and Montenegro drop deep and look to protect the space in behind. Southgate is building a young and dynamic team with raw pace in abundance, but with no space to run into this might be somewhat nullified. Enter the dribblers, who should then have significant opportunity to receive the ball to feet and attack individuals within the opponents’ low blocks. Raheem Sterling and Marcus Rashford were the obvious candidates before the latter’s withdrawal from the squad to face the Czech Republic on Friday night, but Southgate also has two hugely exciting teenagers in his squad – this could be a very good chance for both Jadon Sancho (below) and the uncapped Callum Hudson-Odoi to show what they can do. Looking back at the glorious summer of 2018, Southgate operated predominantly with a 3-5-2 system in which the attacking width was provided by wing-backs Kieran Trippier and Ashley Young. Since then, the head coach has mostly utilised a structure that could be described as either a 4-3-3 or 4-1-4-1. Given that England’s opponents through Euro 2020 qualifying are unlikely to initiate a high press, Southgate is unlikely to return to three centre-backs – he will surely prefer to have an additional body further up the pitch, in the creating and scoring phases. With the growing depths of attacking talent at his disposal, an offensive 4-1-4-1 could be the most likely option – matching the structure we most regularly see from Pep Guardiola’s Manchester City – with more attacking midfielders such as Dele Alli and Ross Barkley filling the advanced central roles (below). Of course, the 4-1-4-1 still requires one deeper-lying midfielder to occupy the position between the defensive and midfield lines. 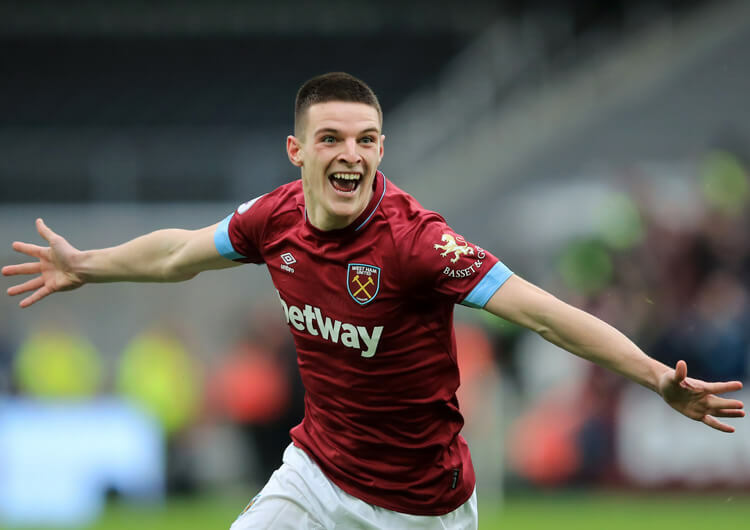 Southgate’s decision would be whether to stick with one of Jordan Henderson or Eric Dier, or introduce new boy Declan Rice sooner rather than later. Set-piece excellence forms a part of the FA’s England DNA – the blueprint and vision for English international football moving forward – and it certainly showed at the World Cup. Southgate’s team showed plenty enough variation in Russia, but there were still two main strategies in evidence. England generally opt for outswinging corners from both the right and left, aiming between the near corner of the six-yard box and the near post. This is done to create two opportunities: the first is an attacking header on goal, as seen when Dier hit the post in the eerily quiet Nations League fixture in Croatia; more common, perhaps, is an initial header guided towards the back post for a runner, usually Harry Kane, who moves on the blindside of the defence with the aim of turning home at the far post. The latter was in evidence not just in England’s late win over Tunisia at the World Cup (above), but also more recently in the home Nations League win over Croatia (below). This has also been a principle in Southgate’s attacking free-kick strategy, whereby the ball is usually clipped towards the back post and then headed across goal – most regularly by the towering Harry Maguire – for an attacker to tap in from an easier angle on the blindside. 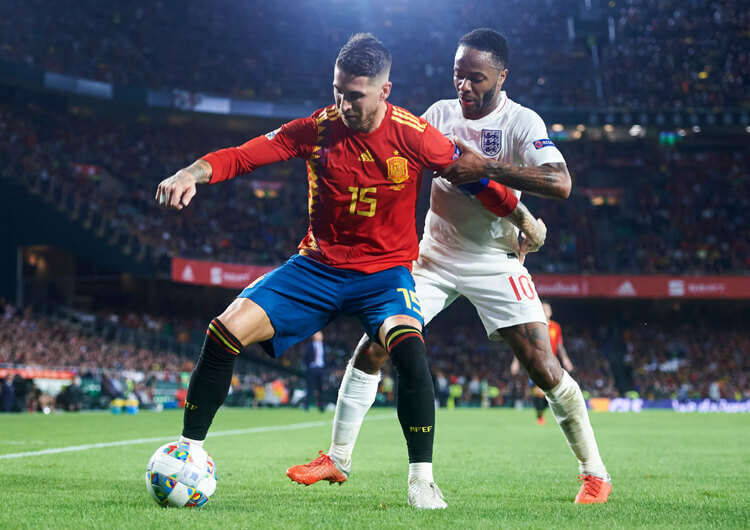 England can expect central space to be limited in these two upcoming fixtures; with progress likely to be in wide areas, it is more than possible Southgate’s men could be firing in a number of corners and free-kicks from the flanks. Hopefully, this will lead to chances and, of course, goals. When England play against teams happy to concede possession and restrict space, one common theme has been for Harry Kane to drop towards the ball during the build. This creates two opportunities based on what the opponent does in response. If the opponent tracks Kane into the deeper area, he leaves space in behind for a runner from midfield to move beyond Kane and receive in this space – Dele Alli has always been particularly effective at this for Tottenham. If the opponent chooses to remain in his position then Kane will be free to receive, turn and advance the attack from his position – as in the above example against Slovenia. This gives the opposition a problem regarding their decision-making, giving the attack a split-second to exploit the resulting space and remove layers of the opposition block. This is one area in which England have not been hugely effective in the Southgate era, certainly when compared with other nations used to having lots of the ball. Horizontal circulation of the ball is designed to move an opponent in order to create gaps within units and force opportunities to penetrate. If the ball speed is slow, however, then opponents can easily adjust their shape and gaps are less likely to appear. With faster circulation, the pressure on the block to move is greater and more errors occur, opening more gaps to play through. To maximise the impact of this circulation, England would want to occupy as much width on the pitch as possible. This can force the opposition to spread out wider, to get closer to the England players all over the pitch – which in turn would increase space inside to allow more central penetration. The more likely outcome is that the opponent will remain centrally compact to protect the middle – where the goal is, of course. This then creates more space out wide, where some of England’s most dangerous players can be used to full effect. Either way, the quicker England can move the ball in these two games against supposedly inferior opponents, the more chances they are likely to create. That’s the theory, of course – we will see over the weekend how the practice plays out.